The Aquarium, Brighton. Photochrom print dated between c.1890 and 1900, published by the Detroit Publishing Co. in 1905, from the Library of Congress (Reproduction Number: LC-DIG-ppmsc-08045). Located between Madeira Drive and the Brighton Palace Pier, just on the approach to the old Chain Pier, the aquarium was designed by engineer Eugenius Birch (1818-1884), with J. S. Nightingale as the architect in charge. Birch had also been responsible for the pioneering but now ruined West Pier. Although work remained to be done on it, the aquarium was opened to the public in 1872. Note: since the old Chain Pier of 1822-23, which is clearly seen on the mid-right of this photograph and still seems to be in use, was damaged beyond repair in a storm of 1896, the picture must have been taken in the earlier part of the decade. The aquarium was a major project. According to Historic England, Birch "had to construct a new promenade and sea wall in order to build it. There was also a reading room, restaurant and conservatory." The grand entrance, complete with clock-tower, was only added in 1874, obviously to make it more prominent (see Antram and Morrice 128). There had been some early criticism in the press, for example in the Daily News of 14 March 1872, of its sunken appearance. In the end, it was even more of a multi-purpose building than Historic England suggests, with roof terraces providing a roller skating rink (this was so much in fashion then) and a terraced garden as well. The exterior that we see now is very different from the original. The aquarium gradually lost its allure, perhaps because of competition from its new neighbour, the Brighton Palace Pier, and was at one point destined to be turned into a bus garage. But in 1927-29 it was remodelled instead, with new facilities added — it had a concert hall, ballroom and bandstand now (see the account in Historic England). It was at this time that the clock tower over the entrance was incorporated into the entrance of the adjacent pier, where it remained until it was replaced after the war. 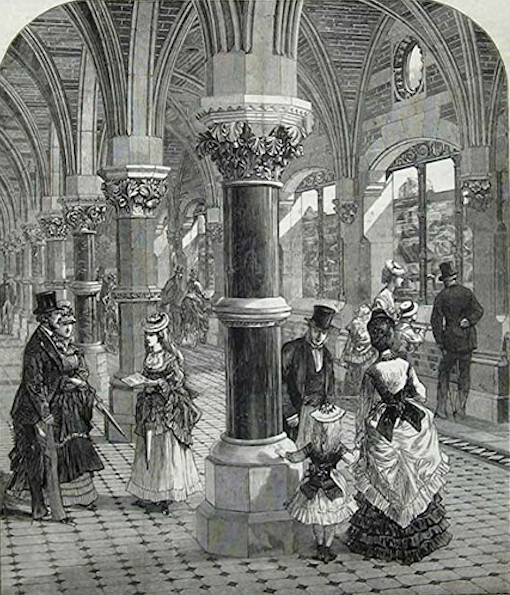 The Gothic interior of the aquarium, from the extra supplement of the Illustrated London News of Saturday 10 August 1872. Despite all the changes, inside the aquarium there is still much of Birch's strikingly Gothic interior to be seen: "an aisled hall twenty-one bays long with double aisles in the centre part, all with quadripartite rib-vaults on polished granite columns" (Antram and Morrice 128). The columns were carved with sea-life forms by Henry Pinker, and were praised in the Daily News report for showing "[c]onsiderable fancy." They were described in a later article in the same newspaper, on 10 August that year, as being "really marvellous." — Jacqueline Banerjee. Antram, Nicholas, and Richard Morrice. Brighton and Hove. Pevsner Architctural Guides. New Haven and London: Yale University Press, 2008. "The Brighton Aquarium." Daily News. 14 March 1872. British Library Newspapers, Part I: 1800-1900. Web. 1 May 2018. "The Brighton Aquarium." Daily News. 10 August 1872. British Library Newspapers, Part I: 1800-1900. Web. 1 May 2018. 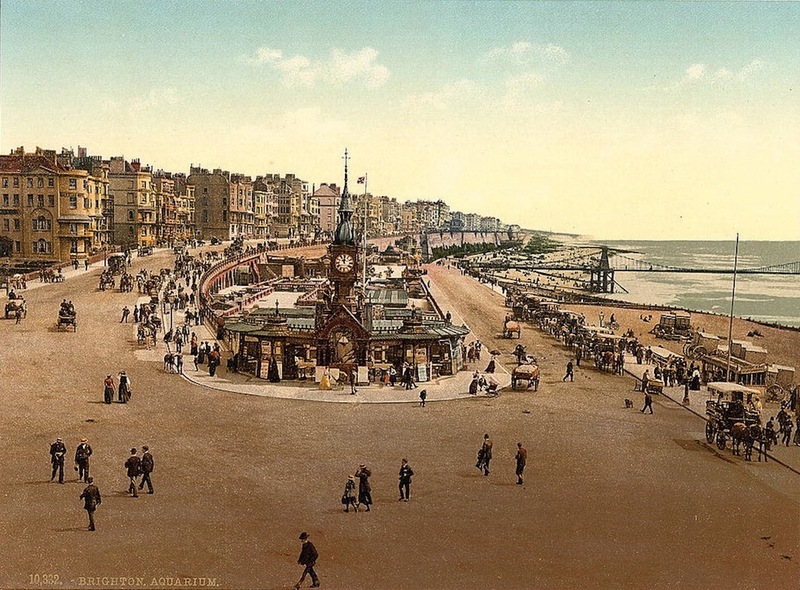 "The Brighton Aquarium, Madeira Drive, Brighton, Brighton and Hove." Historic England. Web. 1 May 2018.